Sorry to disappoint but this isn't a stop action shot. Hope that doesn't spoil the image for you because I really like the image and concept. Lighting details: Clamp Lamp, set on the floor to point up, piece of white paper over it for diffusion, piece of glass about a foot above that. Dandelion arranged so it could lay on it's side by itself, little seedlings spread out. Shot from the top, handheld. Extremely glad this image speaks to you. This one was validated a few days ago, no worries. ummm.... I thought the challenge was to take a color shot of things B/W. I know, for a fact... no dispute, that dandelion spores have a soft tan colour. There is no way you could have taken a colour shot of something B/W if this is your submission... I do think the rules specifically said no desaturation or B/W shooting. Enjoy your second place... even if ya didn't quite follow the rules. One of the most wonderful shot I have ever seen. How did you manage to capture it? You deserve a hefty pat on the back. Congratulations. Idea! super! I love your shot a lot! even if it's not an actual action shot! you simulated one! I really like this one, and nope doesn't spoil anything to know it is not an action shot! Love the idea and strenght of the image. Soooo happpy this one won. Pure form, light and shadow. Beautifully captured. Congrats on the ribbon! Didn't need to excuse the setup, simply beautiful! Very nicely done! Well-deserved ribbon. well done techo. I've always wanted to do this iconic shot. Sweet ~ love it ~ congrats!!! Wow, you're really on a roll! Way to bounce back from the abstract food DQ! Wow that was close. Beautiful shot. Congrats on the red. Great shot - congratulations on 2nd place. Nice work. Light in feel and strong in concept with a winning composition. Congratulations on your RED. Way to go! Great shot and a well deserved ribbon. Congrats! Very nice attractive shot of a nasty plant. This works really well and I expect to see it in top ten. Well done. Back to bump - I really like this shot. Great concept and deftly execution. Bump. Very cool and clever silhouette. Great idea and execution! nice silhouette effect to create b&w, good shot. Good idea to do a sillhouette. Love the sharpness and find your composition beautiful and elegant. One of my favorites in this challenge. Cool idea, nicely done - great composition and contrast. Great photo! It meets the challenge and it's original. I hope this does well. In your desciption, I hope you mention how you achieved this shot. nice idea. Great use of high contrast. wow...how did u get that effect? I am truly amazed. my winner! This is a beautiful picture. I gave you 10. 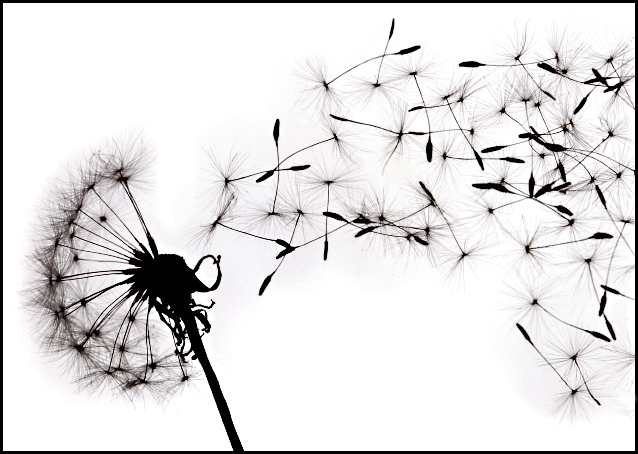 The only thing I can't understand is that there seems to be a grey area underneath the dandelion and seeds and it doesn't really follow the line of the seeds. best picture of the challenge in my opinion ! great capture. i like the lighting. The only issue I have is that the stem is black only because it is super underexposed. I only gave out two 10's and this is one. I love the silhouette here. Very nice job! great simplicity and detail, meets the challenge very well! I bet this looks exceptional at full size. Bumping to an 9. This is one of my favorites in this challenge... Well done! I like the motion and curve. Wish the line of blowing seeds reached into the stem so that some were just beginning to leave; without this the break between the seeds still on and the seeds flying away seems ... odd. Proudly hosted by Sargasso Networks. Current Server Time: 04/26/2019 02:14:49 AM EDT.